Cheeky Donkey: 6Y4M 4Y7M 急にイギリス人？ An English boy? 6Y4M 4Y7M 急にイギリス人？ An English boy? Arata's school had an opening ceremony of their new teaching block. 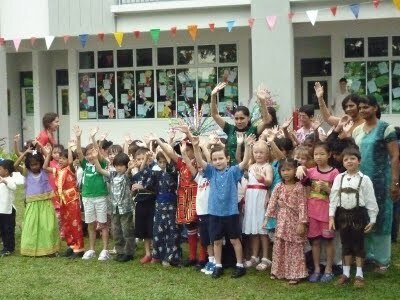 Children have been asked to wear the clothes of their own countries. Arata said, "I want to wear English clothes, because I was born in England." What? Our boys always say, "In our family there are 3 Japanese and 1 Gaijin (= foreigner in Japanese, of course they mean Jason.)" What happened to Arata?? Probably Arata had been into English lots in the last couple of weeks, when Jason's mum was here, and he's started to feel confident in English. But I can only think of an English football shirt for England, or even if he had asked for New Zealand one, it'd probably have been only All Blacks' shirt. 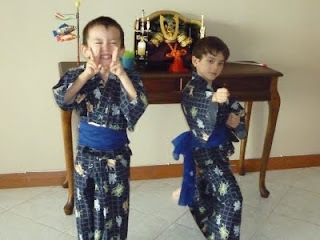 I could manage to persuade him with Japanese Yukata.